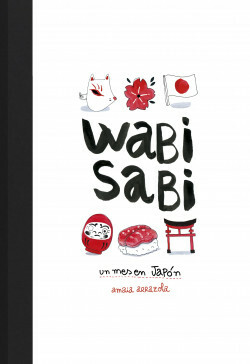 WABI SABI is a Japanese concept that refers to the beauty of the imperfect, of the unconventional. The WABI SABI philosophy consists of enjoying the present and finding peace in nature and small things. One winter day, I went to Tokyo. I was there for a month. I went with the idea of making one drawing every day, creating a visual diary that would encompass the food, the city, and the character of the people, as well as my own fears and insecurities. Drawing on this project, entitled “Amaia Was Here”, I’ve made this imperfect book that has a lot of myself in it, and I hope it has a little of you in it, too. With this visual diary, the author tells us of her experiences in Japan, where she stayed for an artistic residency. Along with her everyday life, she offers information about Japanese culture in the broadest sense of the term: gastronomy, traditions, beliefs, etc.